In search of a light weight and easy to use bolt on axle, Fox and the Racing Applications Development Team (RAD), set free into the cycling world the Kabolt 15mm axle. Geoffe Kabush asked and he received exactly what he was looking for. Weighing in at only 34.5 grams this axle will shave nearly 40 grams from any athletes racing rig. XC, enduro, and slopestyle riders will all benefit from these new axles. They fit all FOX forks with 15QR axles. After having a front wheel skewer failure on the trail I ordered one of these Kabolts, Very light and simple design and tough. Would highly recommend. Not much to say as its essentially an oversized bolt that sheds weight and looks cool. I always carry a mini tool so not a huge deal to remove over the standard quick release. I guess if you crash a lot it won't protect your fork lower as much compared to the trail griding on the quick release lever instead. All in all I'm happy. Now have on all my bikes so much cleaner looking and shaves some weight off just who's fox would make matching rear ones. Although there are a couple of alternatives to the Fox version of this bolt, the slightly higher price is worth it in my opinion because it is by far the lightest. It is 40g lighter than the stock quick release that came with my fork. This clean, sleek axle is a great look on any bike. Love the orange color of the thru axle. But most of all the thru axle is much better then the stock axle. Awesome product. Just buy it you will not regret it. Just what my son wanted. Something looking good, that needs a tool to lock on. Light weight. Great quality. Works great, 1/2 the weight of the stock Axle & looks much better. perfect match for most anodized orange - super light and strong!!! Simpler than stock QR thru axle, lighter as well. This has less extension which prevents getting hung up on trail furniture just a bit. The factory QR actually can protect your fork a bit from dragging along rocks and such, sort of like a motorcycle frame slider. This unit is more flush and the fork can get a bit scratched if dragged along rocks compared to the QR. Scratches might concern some others. Without hesitation would buy again, Recommend. Good looking and i personally think its safer than having normal thru axle. This one is tighten to 17 nM every time you remove and install the tire. Works great! Love the orange. I wish Fox made them for the rear. I wish I could say there are some major performance gains to be had. The truth is, I just don't like the look of quick releases. LOL! Get some! Don't take your axle off frequently, then the Kabolt is a clean looking way to save a little weight. And not snag brush in the quick disconnect. Easily removed when need be, just not as convenient as a quick release. 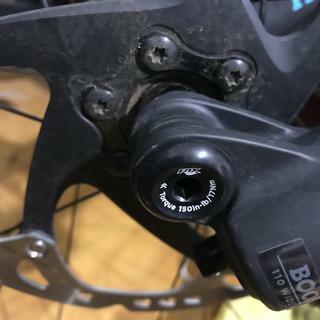 i opted for this on 2 of my bikes because i have a hard time getting the lever on the quick release set just right to avoid a slight brake rub. love the look, finish, and solid feel once its installed. The Kabolt is Fantastic... The ride stiffness/control Great! The Kabolt was the best investment / upgrade that I ever made to my mtb .., especially the Great price. It proved my front end stiffness ratio and eliminated all flex under heavy/deep turns.., I would highly recommend the Kabolt to any serious MTB biker... It's the BOMB!!! Any chance this will work on a pike? BEST ANSWER: Looks like the threads are different. SRAM on the pike. I would say no the Kabolt does not work on the pike. That is my best guess i wouldn't try it. No, you need Rockshox version of the Kabolt. They make them in 100mm and Boost. I haven't any idea since I installed it on a Fox Fork. Does this work with fox 831 15x 100? 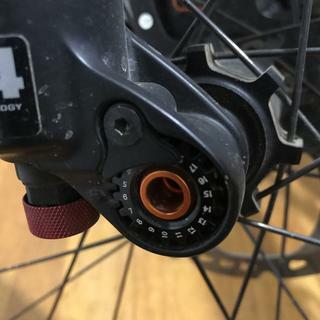 I have a dt swiss front hub, and currently a 15x100 fox/Shimano through axel but it's on the ropes. Fox 15 x 100mm: Flat 1.5mm washer; Axle length: 145.5 mm; Thread length: 11 mm; Thread pitch: M14 x 1.5mm. I think they're all going to be compatible as long as your fork is a fox. yes it should work. regular fox fork is 15x100. What is the weight of 15x110 ? BEST ANSWER: Mine was a 40g weight savings as compared to the quick release that came stock with the fork. does this come in 165,1 mm leghtn?